Amplified Telephones: These are designed for people with hearing loss allowing you to have the ability to increase the volume as necessary. These phones can have captions and bigger numbers. Personal Amplifiers: These are useful in one-on-one conversations. Devices such as Williams Sound personal amplifier or TV Ears will send the amplified sound directly to a receiver that is worn by the listener. It helps reduce the background sound. BlueTooth Devices: Several hearing aids in today’s market are equipped with BlueTooth compatibility that allows audio streaming. The hearing aids can be paired to a TV connect box that allows signal from the television to stream wirelessly to your hearing aids. This provides a cleaner sound signal directly to your hearing aids and you can reduce your television volume significantly. FM Systems: Speech signal is delivered to both hearing aids directly. FM systems are generally used in schools to assist children with hearing loss hear better in a classroom setting. The teacher wears a transmitter and the sound is delivered to the receiver that is coupled to the hearing aids. 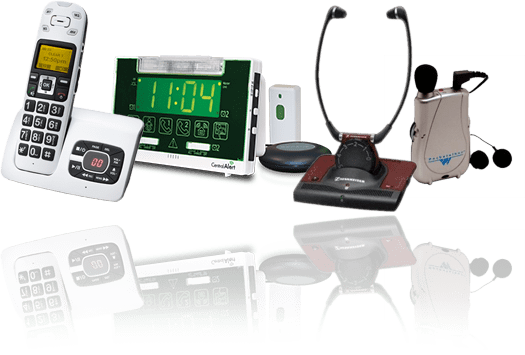 Alerting Devices: Audible signal with vibration such as bed shakers and flashing lights will assist the person with hearing loss to be aware that some condition is occurring. Telecoils: Hearing aids that are equipped with telecoils will pick up sound from a phone or telecoil-based ALD’s such as public places or homes that have induction loops installed.